Runnin’toluvya took the Frank Gall Memorial Stakes. Photo by Coady Photography. 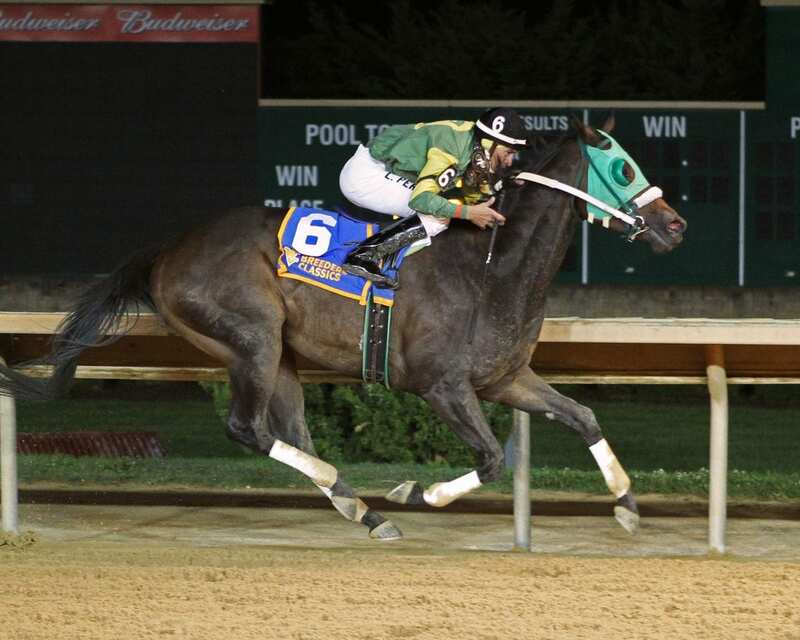 West Virginia Breeders Classics is one of the biggest cards of the Charles Town racing year and it takes place on Saturday with a first race post of 7:00 p.m.
And don’t forget to play in our free handicapping contest. You can enter here. And you can get a 2-page PDF of this document here. 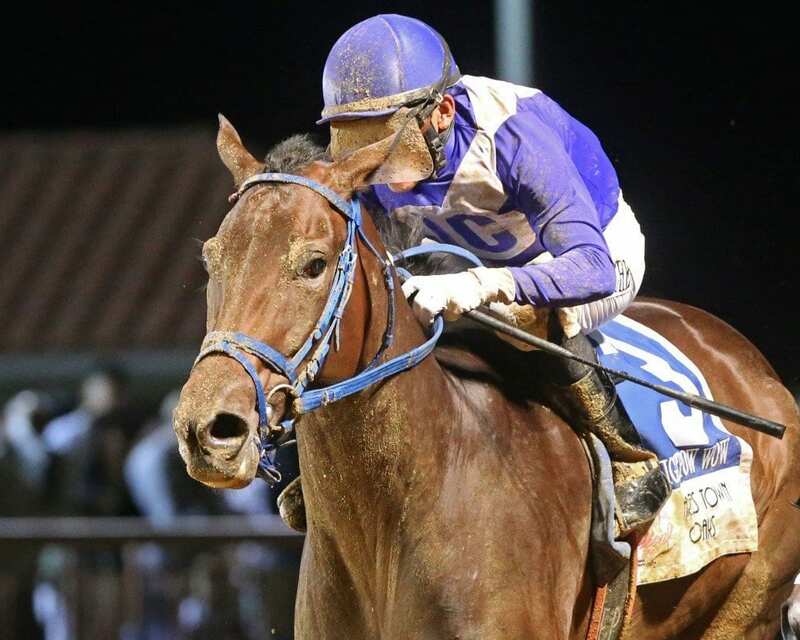 If Charles Town linemaker Paul Espinosa has it right, the big race boils down to a two-horse affair. Trainer Tim Grams sends out the favorite here in #2 Runnin’toluvya (8-5). The Fiber Sonde gelding, a four-year-old, enters on a five-race win streak that is a neck shy of being a seven-race streak. A stakes winner at two, in 2016, he missed all of his sophomore campaign last year. But he hasn’t missed a beat this year, winning six of seven, and, last out, obliterating the field in the $50,000 Frank Gall Memorial by almost six lengths. The one question Runnin’toluvya has yet to answer is his ability to navigate the three-turn, nine-furlong distance of the Classic; that’s a question his major rival, #10 North Atlantic (9-5), has answered definitively. The Jeff Runco trainee hasn’t been worse than second in six tries at the trip and owns four wins. In last year’s Classic, he finished a nose shy of getting the money, just falling to two-time winner Charitable Annuity. He couldn’t reel in Runnin’toluvya two back in an allowance test, but that was at seven furlongs. The added ground here changes that calculus, but then again, North Atlantic is breaking here from the 10-hole; horses breaking from the nine and ten spots are a combined 0-for-11 this year at this distance. Another runner of note in here — one of three that Runco will send out — is #1 Weekend Liberty (6-1). Runco’s go-to rider, Arnaldo Bocachica, sticks with North Atlantic here, but Runco will leg up 2000-race winner Gerald Almodovar on a horse that has a win at the distance and last out was a willing second behind the favorite in here. He also possess one of the oddest streaks you’re likely to see: he has finished second in six consecutive races. #2 Runnin’toluvya (8-5): Wouldn’t be even a tiny surprise if he ran away and hid, as he’s been winning with something left and projects to get whatever trip — leading or stalking — he wants here. The lone concern — that he’s never tried three turns — makes it tough to take short odds on him, but he surely could dominate here. Late Night Pow Wow won the G3 Charles Town Oaks. Photo by Coady Photography. Though it has the shortest field of any race on WVBC night, the Cavada just might have the most interesting group of runners on the card. Trainer Tim Grams will send out the defending champ in this event, the speedy #3 Moonlit Song (5-2), who was dominant a year ago. She hasn’t been quite as strong this year but still owns four wins and as many seconds from eight starts. Last out, in the Sadie Hawkins, she led late and appeared to be en route to victory — but couldn’t hold off Anna’s Bandit. #1 Anna’s Bandit (2-1) has enjoyed a productive season for conditioner Jerry Robb, including both that score in the Sadie Hawkins and a win in the Down Town Allen earlier this season. With Xavier Perez in the irons, she’s won four times this year, including three times in stakes company, and is just shy of $150,000 in earnings for the season. Yet as accomplished as these two runners are, the likely favorite in here is the three-year-old star #4 Late Night Pow Wow (6-5). The Javier Contreras trainee has won seven of eight career starts, with a runner-up effort in the 4 1/2 furlong Its Binn Too Long Stakes back in April the lone blemish, and is three-for-three at the trip. 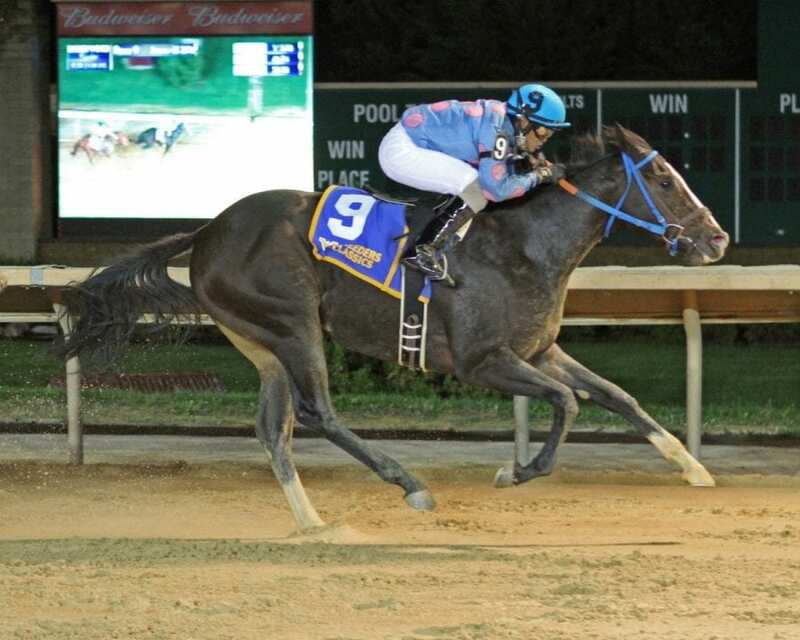 Contreras skipped the Sadie Hawkins last out and instead went hunting bigger game in the Grade 3, $300,000 Charles Town Oaks; in that event, she checked off heels inside the quarter pole, angled out, and prevailed by a neck in a 9-1 upset. No other horse in the field is less than 10-1. Help a Brother won the 2015 Onion Juice. Photo by Coady Photography. Defending champ Help a Brother will look to become a three-time Onion Juice winner in this event — but standing in his way will be the 2016 winner, Follow the Notion. Those two are the biggest names in a 10-horse field. #2 Help a Brother (7-2) won this race in 2015 and again last year. In between, he ran second, falling a half-length short to Follow the Notion. The Lewis Craig trainee looks to be entering this race on an upswing, having won his last two starts, one locally and one at Mountaineer. Two back, he took down Weekend Liberty, who will be running this evening in the Classic. He skipped the Gall Memorial to await this event but has been training steadily since that last win, back on August 4, and the nine-year-old has shown the ability to fire fresh before. #1 Follow the Notion (3-1), the slight favorite in here, has six wins at the trip, his 2016 triumph in the Onion Juice the biggest of his career. Trainer/owner/breeder Gary Williams passed on defending the Onion Juice title last year, opting instead for the Classic, in which he ran an even sixth. He has three wins this year, including a score in the seven-furlong Lucy’s Bob Boy in April, but enters this even on a five-race losing streak. But if you don’t like the chalk in here, there are other places to look. The Leslie Condon trainee #6 Fairweather Friend (4-1) has won two straight by a combined total of nearly 13 lengths. The Jeff Runco-trained #9 Grumpelstiltskin (9-2) didn’t show much in the Gall and has had something of an up-and-down season — but did win last year’s WV Lottery Breeders Classic versus three-year-olds at this distance and rates a threat on best. And the Ronney Brown-trained #8 New Windsor (6-1) is a seven-time winner whose best efforts would put him in the mix here. Scottish Denis winning the 2016 Triple Crown Nutrition. Photo by Coady Photography. If #4 T Rex Express (7-5) looked to be the same runner she was a year ago, the projected short odds would probably feel like a gift. The Jeff Runco trainee was second to Moonlit Song twice in a row, including in the Cavada, and then finished her season with a nine-length win in the 1 1/8 mile My Sister Pearl. But this year has been a bit of a mixed bag, with two wins and a second from seven starts, her lone wins coming at six and 6 1/2 furlongs. Last out, in a local allowance, she stumbled at the start en route to a sixth-place finish behind Moonlit Song, who’s in the Cavada, and Lies and Scandals, who’s here. Interestingly enough, Runco’s go-to rider, Arnaldo Bocachica, who rode T Rex Express last out, lands on one of the trainer’s other runners in here, #9 Frozen Tundra (10-1). 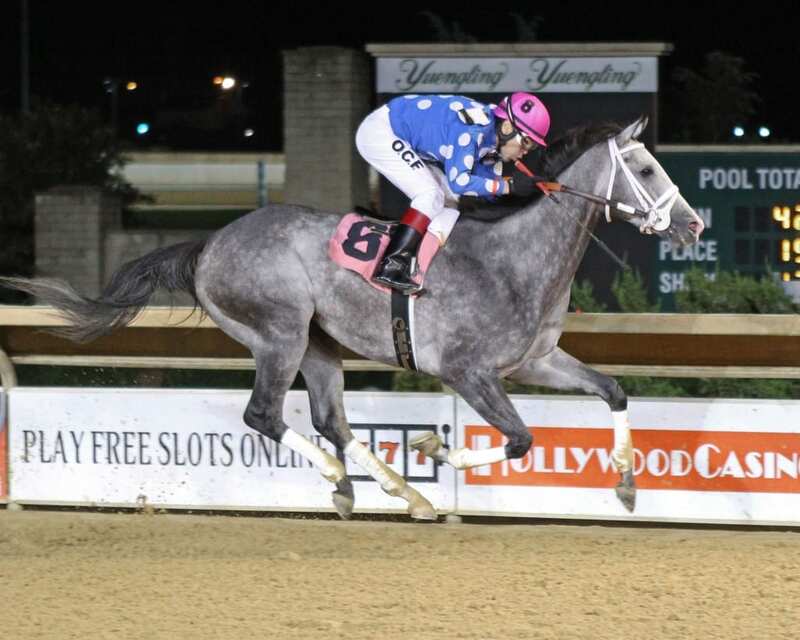 The Munnings filly will make her third start off a layoff, and while she has never been this distance, she does own a three-turn win, having taken a 1 1/16 mile allowance over the strip back in March, an easy four-length score. While 2017 Distaff champ Romantic Cork is not here to defend her title, the runner-up that day — #7 Rock n’ Gold (5-1), trained by Tim Grams — will try her luck again. That second-place finish — by just a half-length — is one of 10 runner-up outings on her 24-race resume. She’ll have Oscar Flores up. Also here will be #3 Scottish Denis (4-1) for trainer James W. Casey, the WVBC’s all-time leader with 32 wins. The Denis of Cork filly has won five times in her career, and while she enters on a six-race losing streak, she’s been chasing some awfully good distaffers, including Anna’s Bandit, Lake Ponchatrain, and others. There’s no question T Rex Express can win in this spot — but it sure feels like this race is a lot more wide open than her 7-5 morning line would suggest.